Beyond Baked » Real food hot chocolate topped with real food vanilla bean marshmallows!! 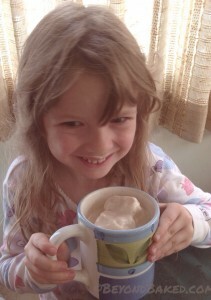 Home Blog Real food hot chocolate topped with real food vanilla bean marshmallows!! Put all ingredients into a pot on low and stir with a whisk until everything is incorporated and it’s reached your desired temperature. Top with real food marshmallows !!! See below. You can use either a stand or hand mixer for this but I recommend a Kitchen Aid. Grease with coconut oil or line with parchment paper, a small glass baking pan. You can go with a 9×11 and get marshmallows over an inch high or a larger pan for smaller ones. Put 1/2 a cup of your water into your mixing bowl. Add to that your gelatin and whisk it around until it’s dissolved, it will be very thick. Next in a small saucepan/pot heat the water and honey slowly until it boils. Keep boiling and keep stirring until it reaches 240 degrees on a candy thermometer. This takes a few minutes of boiling. DO NOT LEAVE THE STOVE or while your doing this part. You don’t want it to boil over. I found stirring it often with a wooden spoon worked really well. Pour this hot honey mixture into the gelatin in your mixing bowl slowly and start mixing at a slow speed. Add your raw vanilla bean. Turn it up to high for about 12-15 minutes or until it forms stiff peaks. Pour/scoop it into a greased and or lined pan and smooth it out as best as you can. They will probably not look perfect 😉 I used a 8 1/2 in x 11 in glass pan. Cover and let set for a few hours to overnight. Use a sharp knife to cut them into squares. They are a soft squishy marshmallow, not as stiff as the ones you buy at the store but they taste so much better!!! !